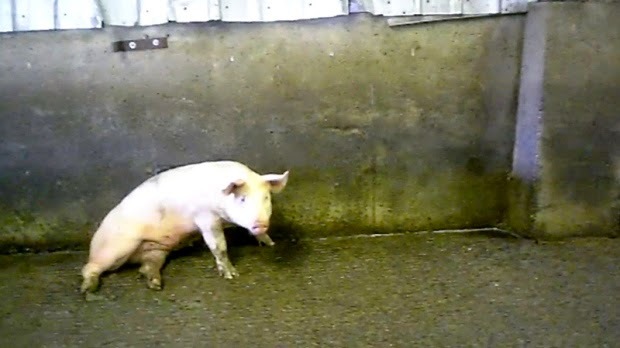 RAISE UR PAW NEWS: CANADA'S PORK TRANSPORTATION SYSTEM - Hidden Camera Exposes Abusive Truth. CANADA'S PORK TRANSPORTATION SYSTEM - Hidden Camera Exposes Abusive Truth. Working on research about the issues that animals face on a daily basis, I sometime find myself not seeing certain matters at hand, overlooking them without knowing that I am doing so, or go through the countless cases and not seeing them until someone points them out to me -- Well that is what happened tonight - a family member immediately called me up to bring to my attention some disturbing and angering news that they had observed on W5 on CTV -- and it did not take me long to start my research and shine the spotlight on this issue at hand, and anyone that knows me well enough knows that I have to put my opinion in for the sake of innocent lives. 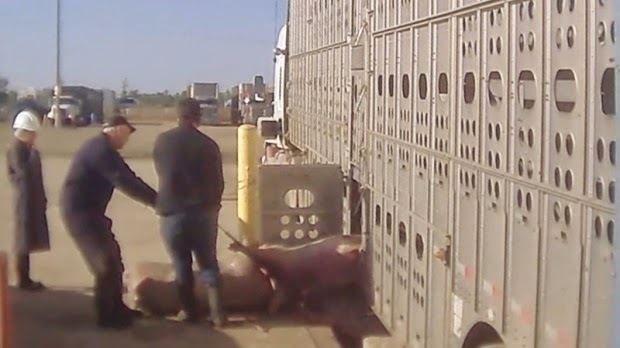 According to the news report, a federally-monitored pork plant, WESTERN HOG EXCHANGE, in Red Deer, Alberta was videotaped doing more than just transporting pigs - it was shown that abuse and cruelty had taken the passenger seat, and was inflicted on these innocent babies by employees. The undercover investigator, who videotaped this inhumane treatment, was a member of the organization Mercy For Animals, who had been undercover for 2 months this summer and stated it was an awful experience. I am sure that anyone in that position, especially witnessing such horrific and brutal crimes against nature would be very much alarmed, heartbroken and even angered by this inhumanity. "Animals that were too sick to stand that were later kicked and abused by employees." The haunting and disturbing images that provided evidence that this cruelty was taking place, opened the eyes of many, capturing even the attention of media. Images of innocent pigs coming off the trucks limping so bad they could barely walk, being overcrowded in the pens that they literally were climbing on top of one another in desperation for space, and the abuse and cruelty that they were being subjected too (being dragged & forced to move by employees wielding electric prods). Even as employees got to go home, these innocent lives are trapped within this hellish environment, no where to escape and continuously having to endure such treatment - and it doesn't seem to bother the employees that are committing these acts, that they are breaking every rule in the book. But what does the chairman of this establishment Brent Moen, say about this disturbing evidence that is brought to light - "the images that were portrayed were shocking and concerning to me." - but is the concern enough to change the ways, and seek justice against these employees who decided cruelty and abuse was more of an option than compassion & respect? will these employees find themselves on the unemployment line, or will they be permitted to continue working there? And what about the CFIA (Canadian Food Inspection Agency) those who are there on site to ensure compliance with Canada's humane transportation laws in preventing the undue suffering of animals from transport to slaughter? In my opinion, since such abuse & cruelty was in the presence of the CFIA or absent from the marshalling area altogether - then they have failed their duty and responsibility to the innocent lives that they are meant to protect, and by this failure it has truly shone more darkness on the meat industry and it's treatment of animals. The CFIA (Canadian Food Inspection Agency) truly needs to enforce strict consequences, to put the industry on probation until matters are cleared up and things have changed, to seek out suspension/firing of the employees that were part of this abuse/cruelty - lay down fines - anything possible that will prevent these crimes against nature from taking place again - and if such actions continue to take place,close the establishment down. It is time for the LAWS to start protecting animals instead of the offenders that are violating the rights/welfare of these living beings. What do you think? ?